In 2017, perhaps more than ever before, we saw the impact that the pro bono and legal aid community can have when everyone bands together to effect change. 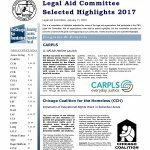 We saw lawyers come together all over the country, and in Chicago we can be particularly proud as is evidenced by the CBA Legal Aid Committee’s Selected Highlights from 2017. 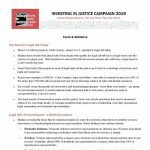 The Committee’s—which the CBF staffs—compilation highlights some of the very best of how pro bono and legal aid can have a positive impact on every level, from helping individual clients to sweeping class actions, from legislation and far-reaching policy changes to entirely new programs, like the Illinois Armed Forces Legal Aid Network, that help people most in need. These highlights include everything from how advocates helped to end the Illinois budget crisis to collaborations addressing the needs and fears of our immigrant neighbors and their families. 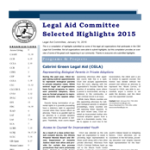 The CBA Legal Aid Committee—which the CBF staffs—recently published a compilation of highlights submitted by some of the pro bono and legal aid organizations that participate in the Legal Aid Committee. 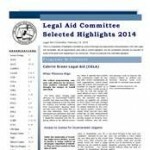 Legal Aid Committee—Selected Highlights 2016 features news from 29 pro bono and legal aid organizations on: programs and projects; class action; significant litigation; and policy changes and legislation. Not all organizations were able to submit highlights, but this compilation provides an overview of some of the great work happening in our community. 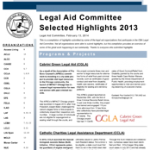 The CBA Legal Aid Committee—which the CBF staffs—recently published a compilation of highlights submitted by some of the pro bono and legal aid organizations that participate in the Legal Aid Committee. 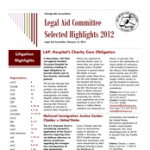 “Legal Aid Committee—Selected Highlights 2015” features news from 27 pro bono and legal aid organizations on: programs and projects; policy changes and legislation; and cases, class actions and systemic litigation. Not all organizations were able to submit highlights, but this compilation provides an overview of some of the great work happening in our community. 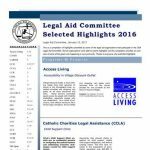 This is a compilation of highlights submitted by some of the legal aid organizations that participate in the CBA Legal Aid Committee. Not all organizations were able to submit highlights, but this compilation provides an overview of some of the great work happening in our community. Thanks to everyone who submitted highlights. 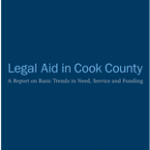 In addition to the fundamental impact of legal aid in helping to ensure equal access to justice, a new study published by The Chicago Bar Foundation and the Illinois Equal Justice Foundation found that legal aid in Illinois produces almost a 2:1 return on investment. 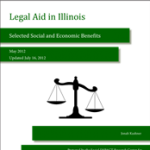 Using a limited sample, the study found that legal aid services produced economic benefits of more than $70M in a year. 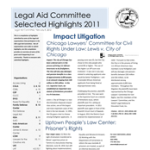 This 2010 report addresses the current demand for legal aid services, how services are being provided and where funding comes from for this work.